The current world-system is as doomed as the Titanic. We're like the passengers on the Titanic 10 minutes after the mighty ship struck the iceberg: there is virtually no evidence to those on deck or those snug in their warm cabins that everything they reckoned was safe and secure was doomed to perish. Only those who witnessed the damage below the waterline and who knew the limitations of the ship's design grasped that the loss of the ship was inevitable and could not be reversed. The current world-system (call it whatever you like--cartel-crony neoliberal-state capitalism, etc.) is as doomed as the Titanic, for the same reasons: the design of the system is the source of its failure. Why is the current world-system doomed? 1. Automation will not just continue replacing human labor--the pace of this trend is increasing exponentially. 2. The wishful thinking that technology always creates more jobs than it destroys is, well, wishful thinking: just ask the music industry, which "grew" in the era of digital technology from a $14 billion industry to a $7 billion industry. 3. The wishful thinking that taxing the owners of robots and software will pay for guaranteed income for all: nobody who favors this seems to have done any math. Current corporate profits (which are about to be eviscerated by global recession and the commoditization of goods and services via automation) are around $1.9 trillion annually, while current government (federal, state, local) spending is $6.2 trillion. So if the state took every single dollar of corporate profit (and how realistic is that? ), that would fund less than a third of current state spending. And if the state is going to pay tens of millions of additional households a guaranteed income, state expenditures will rise by trillions more. The idea that profits can support this enormous spending is simply not realistic. 4. Since taxing profits won't work, let's tax wealth. Once again, this isn't realistic. For one thing, concentrated wealth has captured the political machinery, so politicos aren't going to impose wealth taxes on the hands that feed them. Secondly, wealth is increasingly mobile. When faced with high taxes, wealth simply moves to more hospitable locales. 5. Well, then we'll tax land--they can't move that, can they? No, but as economist Michael Spence and his colleagues have pointed out, profits and gains are increasingly flowing not to traditional labor or capital (financial capital, land, etc.) but to the third form of capital, which is innovation, new business models, etc. So taxing land may look promising on paper, but wealth will flow to outsized returns, and if land starts getting taxed at a high rate, wealth will migrate to the third form of capital, which is mobile and global. Remember that we're not talking a mere trillion or two here: to fund the existing government we need to lay our hands on $6.2 trillion every year, and paying a guaranteed income to everyone replaced by automation will kick that higher by a few more trillion. 6. 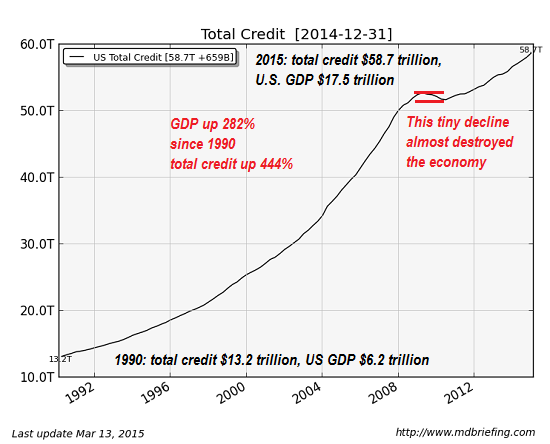 The issuance of money and credit are not connected to the creation of jobs. Very little of the vast sums of money and credit issued since the 2008 Global Financial Meltdown flowed into productive investments that generated new jobs. Most of the money went into "investments" that are wealth-skimming operations that don't create a single job: stock buy-backs, for example, or buying rental units and raising the rents. It doesn't require a single additional worker to maintain those rental units under the new owner; the only things that changed were the rent (higher), the profits skimmed by the new owner (higher) and the disposable income of the tenants (lower). 8. The system requires permanent growth of everything simply to keep from imploding: more debt, more jobs, more wages (and payroll taxes on those wages), more profits, more consumption, more taxes, more, more, more. Unfortunately, there are limits on all of these, and the moment the system stops growing it doesn't just lag--it implodes. 9. Nearly "free" credit/capital only further incentivizes the replacement of labor (whose overhead costs are rising relentlessly) with robotics/software. There is much more in these two discussions; please give them a listen. 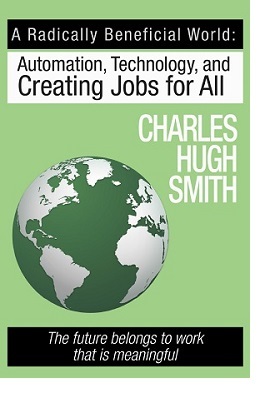 This entry is drawn from my new book A Radically Beneficial World: Automation, Technology and Creating Jobs for All: The Future Belongs to Work That Is Meaningful. Get a 25% discount on my new book (offer extended to 11/22/15). Here is the link to the book's Amazon.com listing, Introduction and Chapter One (free PDF). Thank you, Jane O. MD ($50), for your superbly generous contribution to this site -- I am greatly honored by your support and readership. Thank you, Anthony S. ($5), for your most generous contribution to this site -- I am greatly honored by your steadfast support and readership.